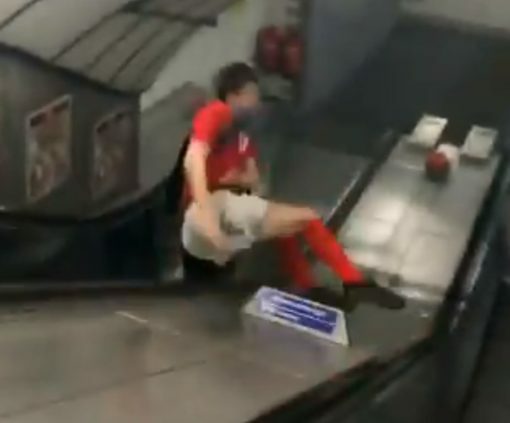 Who’s the teenager that slid down the center of a subway escalator in hilarious, cringe-worthy viral video? You’ve probably seen the Instagram video, tweet or Facebook post where a teenager is videoed sliding down the center median of a subway escalator in the London Underground before hitting a couple speed bumps that completely tosses him off the median in hilarious fashion. You cringed, then laughed, then watched it all over again. The incredibly-clear video has been viewed over 30 million times across all social platforms in the last 48 hours. As it should, it had all the makings of a viral video — it’s a short video of someone doing something stupidity, getting what they deserve, fear, empathy, it’s cringe-worthy and an awesome payoff. Who is the kid in the video? ORIGINAL VIDEO!! Escalator surfing Gone Wrong!!! Ouch. LOL. Ouch. With the camera right on him, you can see the Freddie’s face as he realizes that he made a grave mistake. 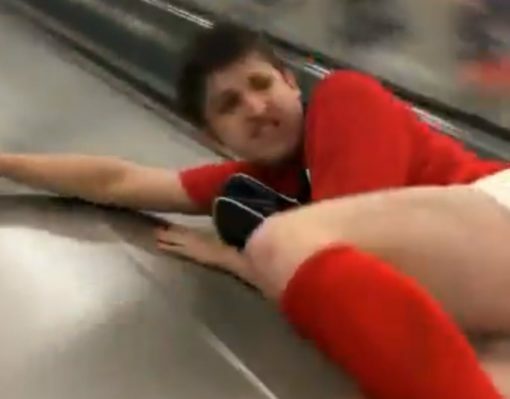 As his face flashes by the camera taping him, you can clearly see his friends using the escalator’s correctly laughing at him and the dread on his face as he builds up speed, helpless to avoid whatever his fate ends up being. As it turns out, his fate is to build up just enough speed before hitting the final barrier that violently knows him onto the other side of the Tube’s escalator; presumably taking him back up the escalator he just came down at 100 kilometers per hour. You think he tried surfing the escalator down again? In any case, the video was originally posted on Twitter by his friend James Gower and has gotten every type of social media affirmation: likes, comments, retweets, hearts, shares, you name it, it’s got hundreds of thousands. If you’re concerned with Freddie, don’t worry. His friend James mentions that “he’s alright. Few cuts and bruises but he’s all good.” Don’t forget the bruised ego and pride (presses replay again).